Sarah ain't had a proper summer if her knees ain't scraped-up'n'bruised. This summer has mostly been filled with biking. And while I love biking, it keeps my knees a little too pristine. Thankfully my friend, Phil, and I went on a backpacking trip this last weekend to the Cascades. This trip enabled me to roughin' up my knees for this summer. 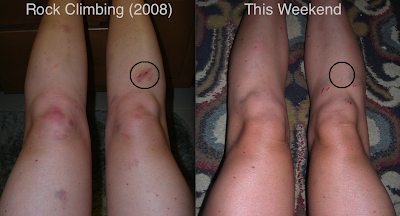 The photo on the left shows my knees after the first time I went rock climbing, five years ago. The photo on the right shows my knees after this weekend. Granted my knees aren't nearly as beat up as they were after that rock climbing trip, but they've still earned some color to them. Great memories are memorialized by body scars. The proof is in the black circles. You: Backpacking, did this to your knees? Phil and I did this same backpacking trip back in September 2009. It was fun to compare the photos from this year's trip and from our trip four years ago, as we had many of the same photos, even wearing many of the same clothes. We left mid-day on Friday and drove to the Tucquala Meadows Trailhead, where we began our hike. My pack, resting at Squaw Lake on the hike in. The trail combines with the Pacific Crest Trail for a little while. At one point we passed a thru-hiker, who described himself as a "slow, long-distance hiker." Our hike was slowed by the fact that it was prime blueberry season, and little blueberry bushes were scattered all along the trail. With stained-blue hands and happy tummies, we hiked the five or so miles back to Peggy's Pond, where we pitched the tent in the same place we did last time. On Saturday, we hiked to the top of Mt Daniel, via the southeast ridge. At 7,960 feet, Mt Daniel is the highest peak in King County. Some of the ascent to Mt Daniel was hiking, and some of it was scrambling. There were a few rocks that needed some loving along the way. In true Sarah-style, I hugged them with my knees, giving them some of my blood for good luck. It was this rock-loving that enabled me to earn my banged-up knees for this summer. Due to time constraints, we only made it about half-way up Daniel on our last trip. This weekend, though, we bagged the east peak, at 7,899 ft. We'll leave the true summit, which is 61 feet higher, for our next backpacking trip, which, if history is any indication, will likely occur four years from now, in 2017. Phil and me, at the top of Mt. Daniel. Beautiful views were had all around. Mt Rainier and Mt Adams to the south. Mt Baker and Glacier Peak to the North. Looking off towards Mt. Rainier. We joined two gentlemen at the top who had ascended a portion of the mountain via the glacier. Snow travel is so much easier than scrambling on loose rock. The next time we'll bring our ice axes! Phil had summited Mt Daniel once before, sometime in the '80s. He remembers ascending most of the mountain via the glacier. The glacier has thinned considerably since then. There's a good chance there may not be any glacier left the next time we climb Daniel! We descended back to Peggy's Pond. I was happy with a mid-thigh soak in the cold water, but Phil decided for a full-body immersion. 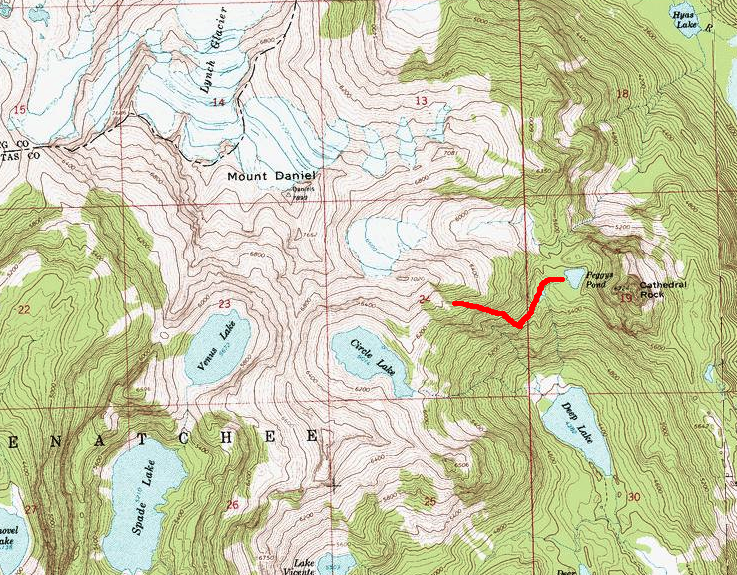 On Sunday, we attempted to scout out a route to Circle Lake from Peggy's Pond. 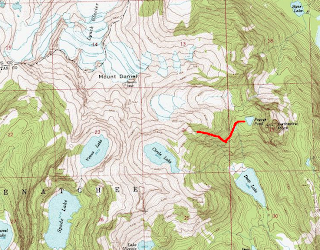 With a little bit of bushwhacking, some more knee loving, and lots of scrambling, we found what we deemed to be THE most difficult way to approach Circle Lake. And even then, we were still a good distance from the lake. We don't suggest you follow this route. We headed back to the trailhead Sunday afternoon, which allowed us to return to Seattle before the mad end-of-the-long-weekend rush on Monday. Refilling our water bottles on the hike back to the trailhead. Phil, thanks for getting me out to the Cascades for a backpacking trip this summer. You and I definitely know how to have a good adventure together; my knees are always proof our good times. 1) Scrambling and rock climbing are not supposed to give you banged up knees. I'm just very...hrmm..."talented" at engaging in these activities. 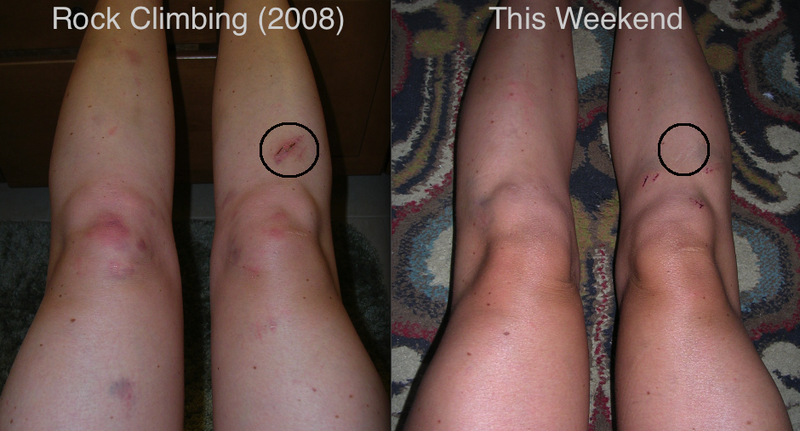 2) Truth be told, it cracks me up every time I see my bruised'n'scabby knees. It reminds me of a good time. And it also reminds me to add an item to my bucket list: Return from an adventure involving rock without a single bruise or scrape on my knees. Think I can do it? Oh, and remember that thru hiker that Phil and I saw at the beginning of our backpacking trip? Well, his photo was later posted on the Hiker Haven's Facebook page. (See the Bicycling to a Wedding post.) How cool that he stayed where I stayed the prior weekend! It's a small world, my friends!